Sinai: Was It The MOSSAD, the CIA, ISIS Or All Three? Browse: Home / Sinai: Was It The MOSSAD, the CIA, ISIS Or All Three? The black boxes have not even been recovered yet and already the conspiracy theories are emerging from every quarter regarding the obvious act of terrorism which took down the Russian passenger jet. Each of the conspiracy theories do have one common denominator … or, more accurately, 3 co-conspirators —ISIS, Israel and The USA. Everything about this aerial takedown smacks of a highly coordinated missile attack or planted bomb plot. All of the circumstantial and anecdotal evidence points directly to one or the other. Even though ISIS has since claimed responsibility for a missile attack, that may be cover for a much more complex Zio-ISIS-American black operation. Of course, both Israel and the USA do possess advanced electronic warfare weaponry that can take an airliner out of the sky with the push of a button. Those directed energy weapons utilize EMP technology and can be fired from American space-based weapons which are situated on strategically located satellites. This same type of technologically advanced weaponry can also be discharged from specially equipped battleships and ground-based facilities. The following excerpt from one of the sites pointing to a conspiracy makes some very good points. Particularly in light of the MOSSAD motto — “By way of deception, thou shalt do war” — this blackop has all the typical trademarks of the MOSSAD brand of terrorism. As always, this naked act of terrorism against Russia was likely perpetrated by the MOSSAD with the blessing of the CIA, as well as ISIS playing the willing dupe. 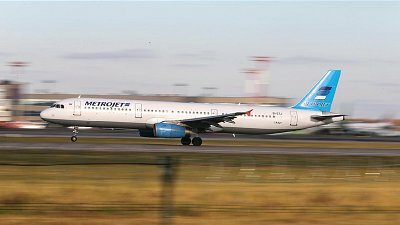 WHO EXACTLY WAS ON BOARD THAT RUSSIAN AIRLINER & WHAT WAS THEIR MISSION? The intensifying Russian-Egyptian collaboration looms VERY large over the Mideast Geopolictical Chessboard for the Zio-Anglo-American Axis. There’s a critical point here. Both the USA and Israel would prefer that the whole world believe this was an ISIS act of terrorism. In this way both nations can attack Russian assets at will — throughout the Mideast region and beyond — and then simply use their MSM to point to the fake perpetrator ISIS. As a quite willing patsy, ISIS will take credit for destroying anything even remotely associated with Russia at this point of their daily annihilation throughout the Levant. However, all of the technical and logistical requirements of this Sinai false flag operation realistically incriminates both the CIA and MOSSAD, as usual. Only in this way can the Western powers send a serious message to Putin’s Russia that they will take advantage of Russian exposure both in the Middle East and throughout the entire world. The Russian Federation already has its work cut out protecting its own borders from ISIS infiltration. 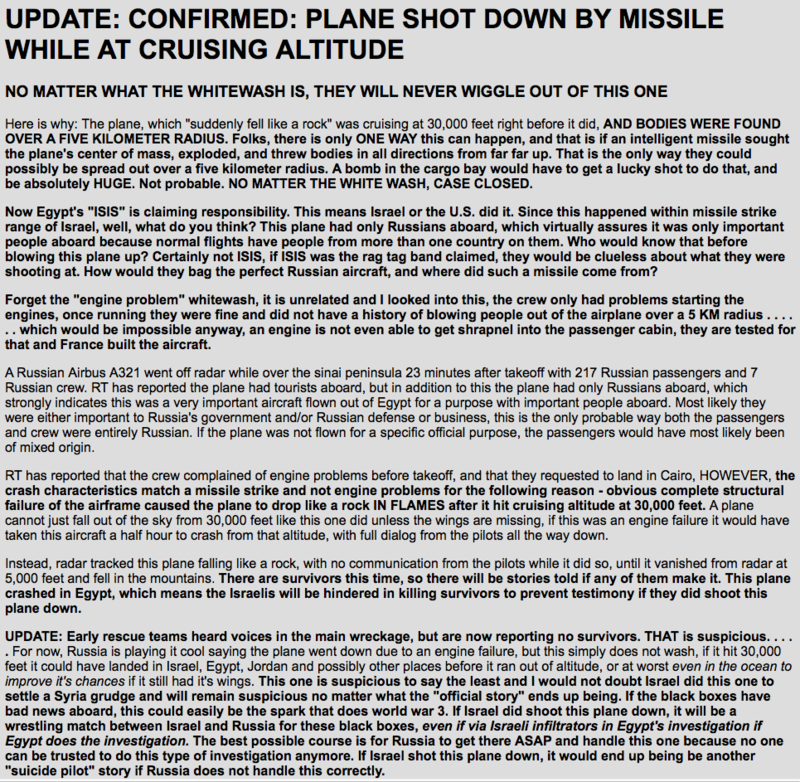 However, the singlest biggest question about this airliner takedown is: Who exactly were those 224 people on board. If they were, in fact, Russian intelligence agents and technicial elites, there will be hell to pay.